Arunachal Pradesh Chief Minister Pema Khandu in his second day here visited the famous Shiva Lingam of Sidheswar Nath temple today. 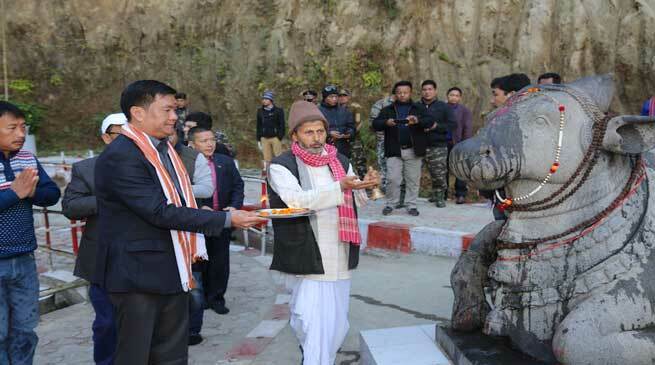 He was accompanied by PHED Minister Takam Pario, Hydropower Parliamentary Secretary Phosum Khimhun, Transport Parliamentary Secretary Likha Saaya, Raga MLA Tamar Murtem, Ziro MLA Tage Taki, DC Kemo Lollen and SP Ziro Tage Habung. The Chief Minister offered his prayers spending almost half and hour. On arrival, he was received by the temple priests who performed rituals and chants. The Shiva Lingam was discovered miraculously in July 2014 as mentioned in the Shivapurana, which says that a tall Shiva Lingam will appear at the place, which will be called Lingalaya, according to the Sidheswar Nath Temple Committe, Ziro. The Lingam has become a great attraction centre in Ziro attracting devotees and tourists from nearby and far flung places.